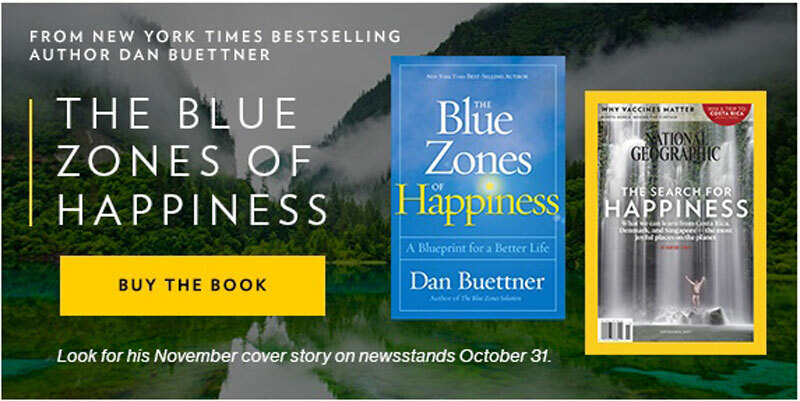 Recently National Geographic Explorer and best-selling author Dan Buettner searched for the happiest Americans. Where he found them will surprise you or maybe it won’t. Dan Buettner and Gallup’s social scientists teamed up to develop an index that assesses measurable expressions of happiness and identifies where Americans are living their best lives. Designed by Gallup senior scientist Dan Witters, the study established 15 metrics—from eating healthy and learning something new every day to civic engagement, financial security, vacation time, and even dental checkups—that signal happiness. The National Geographic Gallup Special/Blue Zones Index draws on nearly 250,000 interviews conducted with adults from 2014 to 2015 in 190 metropolitan areas across the U.S. The winner, not surprising was (drum roll please): Our very own Boulder, Colorado. Bolstered by a sense of community, access to nature, sustainable urban development and preservation policies, and perhaps even that clean mountain air, Boulderites overwhelmingly feel “active and productive every day,” according to Buettner’s research. Per capita, more people walk to work in Boulder than in any other city in the U.S. Low rates of smoking and obesity, and high rates of exercise, contribute to the satisfaction locals feel. Life is not always rosy in the Rockies—stress is on the rise; on average, 49 percent of locals surveyed reported feeling stress—but the qualities that keep Boulder on top make this city America’s happiest. Be sure to check out our neighbor to the north at number 4! 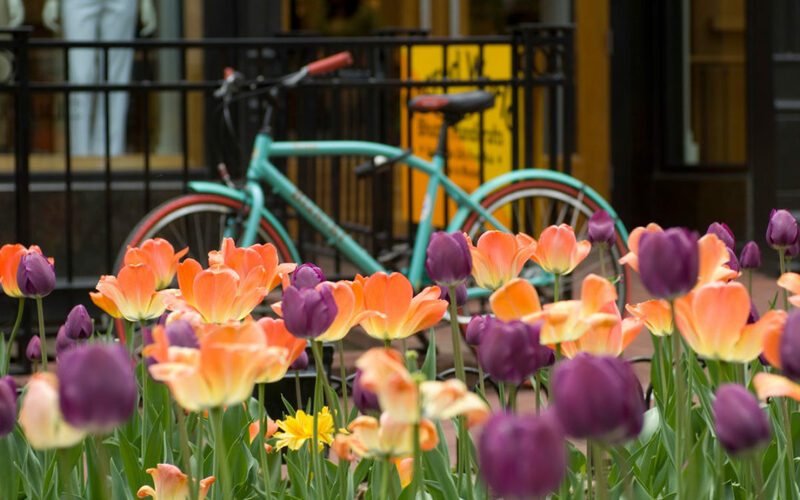 #1: BOULDER, COLORADO Boulder, Colorado—the happiest city in America according to the National Geographic Gallup Special Index—is best explored on two wheels, with over more than 300 miles of dedicated bikeways. #2: SANTA CRUZ-WATSONVILLE The Santa Cruz-Watsonville area on California’s central coast boasts beautiful beaches, a family-friendly boardwalk, and one of the state’s oldest amusement parks—all overlooking stunning Monterey Bay. #3: CHARLOTTESVILLE, VIRGINIA Along the foothills of the Blue Ridge Mountains, Charlottesville, Virginia, has ample opportunities for getting outdoors between visits to Monticello and the University of Virginia—both listed as World Heritage sites. #4: FORT COLLINS, COLORADO The historic storefronts in Fort Collins, Colorado’s Old Town inspired the design of Disneyland’s Main Street, U.S.A. Add in its views of the Rocky Mountains, and it’s no wonder Fort Collins ranks among the happiest cities in America. #5: SAN LUIS OBISPO, CALIFORNIA The area around San Luis Obispo, California, has no shortage of incredible day trips. Locals and visitors can relax at wineries, explore sand dunes, or take in coastal views along hiking and biking trails. #6: SAN JOSE, CALIFORNIA Known for being the capital of Silicon Valley, San Jose, California, is located on the southern shore of the San Francisco Bay and sees about 300 days of sunshine each year. #7: PROVO, UTAH The third largest city in Utah, Provo sits between Utah Lake and the Wasatch Range. This makes for an intoxicating blend of city culture and outdoor recreation, with fishing, hiking, and rafting all just a stone’s throw away. #8: BRIDGEPORT-STAMFORD-NORWALK, CONNECTICUT Just 40 miles from New York City, Connecticut’s Bridgeport-Stamford-Norwalk metro area has endless cultural experiences nearby. But many locals stay put for work: The region has one of the largest concentrations of corporations in the country. #9: BARNSTABLE TOWN, MASSACHUSETTS Situated on Cape Cod, Massachusetts, the Town of Barnstable stretches between Nantucket Sound and Cape Cod Bay. It’s made up of seven idyllic villages, including Hyannis. #10: ANCHORAGE, ALASKA Anchorage is the starting point for countless Alaskan adventures, with five national parks nearby and plenty of daylight during the summer.